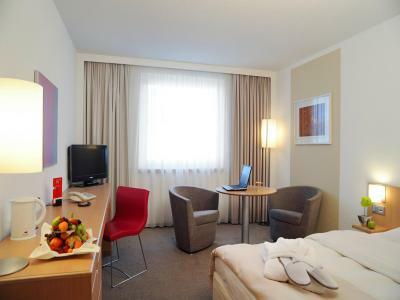 Lock in a great price for Novotel Düsseldorf City West – rated 8 by recent guests! Clean spacious rooms , excellent amenities and toiletries , good buffet spread ! Big and comfortable room in great value for money! Clean and the staff was very kind and helpful! Location is good, staff is also helpful if you need them. Loction of Hotel & nice staff. Easy todrive from & to Hotel. Location is good. 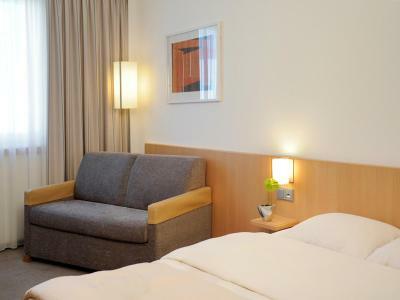 Hotel is modern, clean and staff generally very personabel and helpful. Breakfast buffet is generous. Room good size and bed quite comfortable. Bathroom is new by rather outdated style. Clean and tidy, everything punctual and on the spot. The hotel is really worth of my money, and my three years old son enjoy the play area very much. 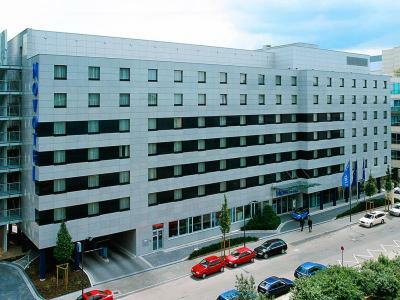 Very cheap hotel and easy to find the U-bahn for go to the city. As you expect a business travellers hotel to be. Bland but purposeful, overpriced but you knew that anyway. They all are. 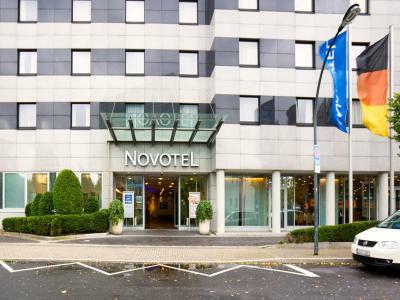 Novotel Düsseldorf City West This rating is a reflection of how the property compares to the industry standard when it comes to price, facilities and services available. It's based on a self-evaluation by the property. Use this rating to help choose your stay! 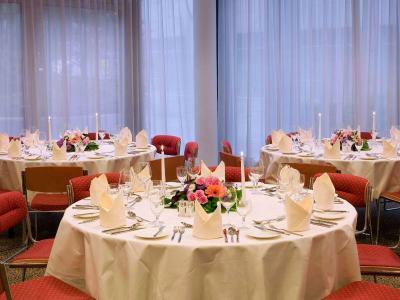 This 4-star hotel in Düsseldorf features spa facilities and on-site parking. It is a 15-minute train journey from Düsseldorf city center. Am Seestern Underground Station is directly opposite. 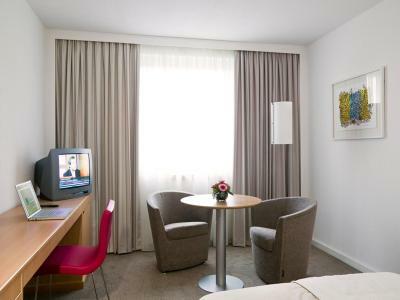 All of the air-conditioned rooms at the Novotel Düsseldorf City West have free Wi-Fi internet, cable TV and a mini-bar. 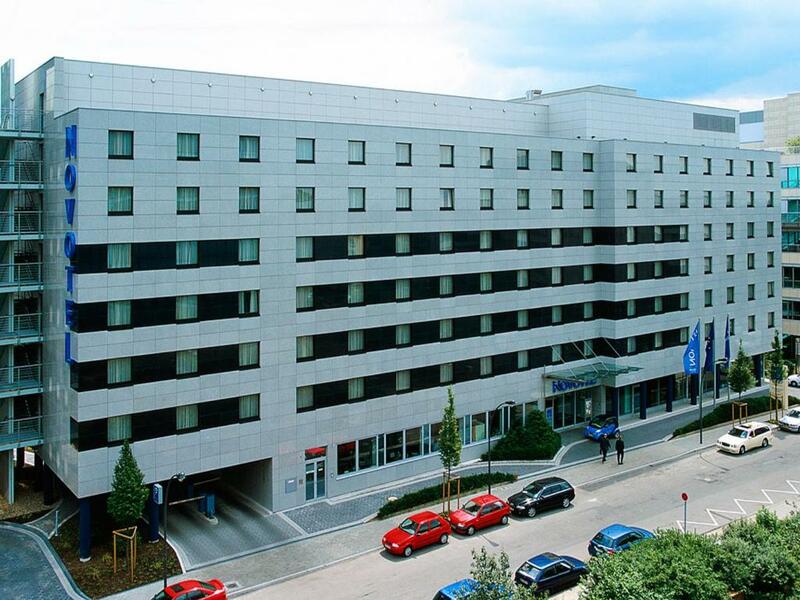 Spa facilities at the Novotel Düsseldorf's spa include a sauna, steam room and fitness studio. Guests can enjoy Mediterranean specialties in the Le Jardin restaurant. The bar serves a variety of drinks. Meals and drinks can be enjoyed on the terrace during the summer. 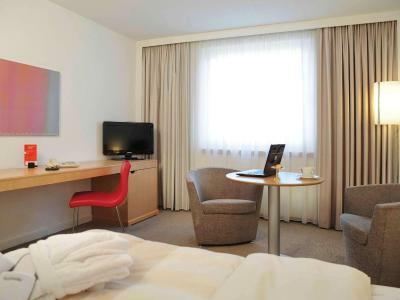 When would you like to stay at Novotel Düsseldorf City West? 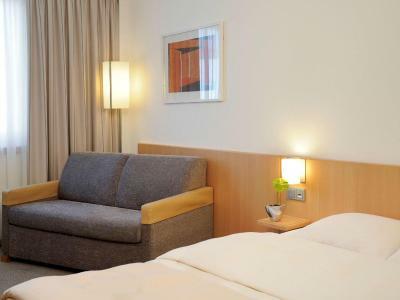 Air-conditioned room with free WiFi, satellite TV, a free mini-bar, and a safety deposit box. Toiletries and a hairdryer are provided in the private bathroom. This quiet room also offers free room service, a tea/coffee maker and bathrobes. This air-conditioned room has free Wi-Fi, satellite TV, a minibar, and a safe. Toiletries and a hairdryer are provided in the private bathroom. 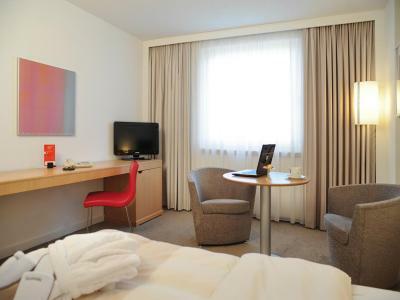 House Rules Novotel Düsseldorf City West takes special requests – add in the next step! 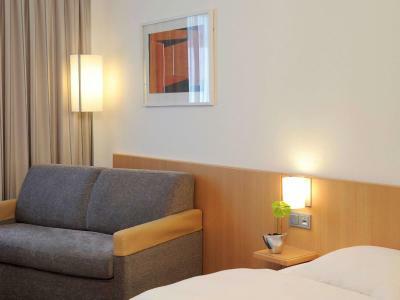 Novotel Düsseldorf City West accepts these cards and reserves the right to temporarily hold an amount prior to arrival. the place for breakfast could be more prepared for single peoples. I encountered situation that there were may 4 persons tables with only one sitting there and the smaller one (for two) were not so many.. this wastes some space and makes sometime a problem with getting seat during morning "rush hours" if you're not alone. Bed was good and i slept well. Breakfast was good and various. I had a feeling that scrambled eggs were done not from powder which is important for me. Reception staff a bit overwhelmed by number of check-ins and so failed to inform a colleague, who was in the lobby, of some important information. No place to smoke, had to dress up and get outside every single time we wanted to enjoy a cigarette. All the staffs are easy open and enter your room if just they want to clean...maybe good for the business trip and you leave the hotel before 9a.m. Kettle in the room did not work. Tray holding Tea, Coffe and Sugar had an old discarded salt sachet in the bottom and was dirty. Only one coffee sachet but didn't really matter as kettle wasn't working. Expensive parking and as we were 3 adults and 1 child we only booked breakfast when we arrived costing us a total of £215.00 over our initial price. found looking for channels on the TV was difficult, a list of what was available would have been helpful.